The Strokes have spent the past two years teasing us with tentative ideas on when they will release their album, and each time the dates have come and gone. Just take a look at Hotcakes’ first EVER post way back in January 2009 to see how long we have waited for this one. Well the time has finally arrived, and a firm release date of March 22nd has been confirmed by band bassist Nikolai Fraiture. Exciting. To add to that, the first single is due to start getting airplay in February. Nothing has a name yet though. In terms of sound, the band reckon this album would have fitted in well between 2nd album Room on Fire and 3rd effort First Impressions of Earth. A step backward, some may think? No way. The closer this band get to Is This It? the better. Despite their second and third albums being excellent, they have never better the brilliance of their debut. Personally, I would be really interested to see if Julian Casablancas decides to bring back the voice filter he uses throughout the first album at all. I’m a big fan of that effect, with Perfume Genius using it well recently. 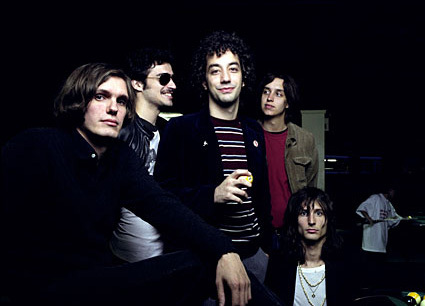 This entry was posted on 10 January, 2011 at 10:18 pm and is filed under News with tags 4th album, the strokes. You can follow any responses to this entry through the RSS 2.0 feed. You can leave a response, or trackback from your own site.